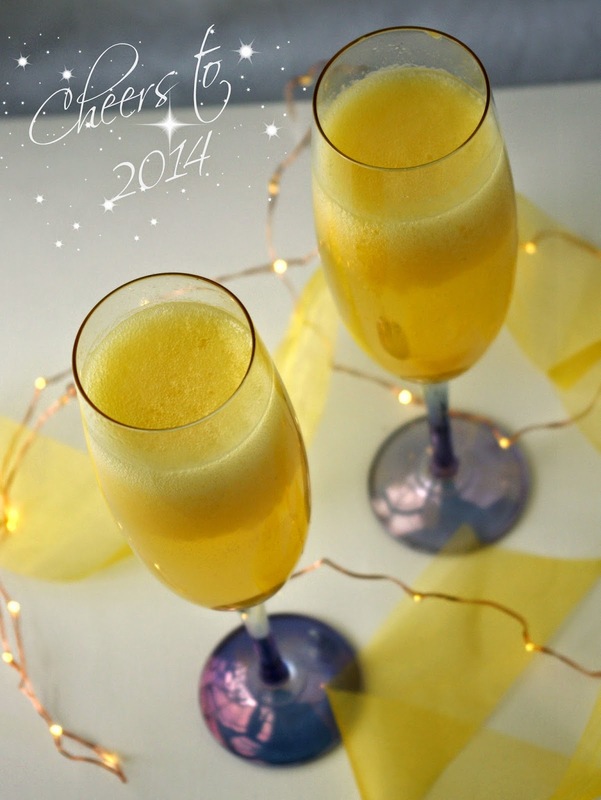 Here's a cocktail recipe for you so we can have a virtual toast to the year! It's a simple recipe with a twist which hopefully represents the type of recipes I've tried to bring you over the year. 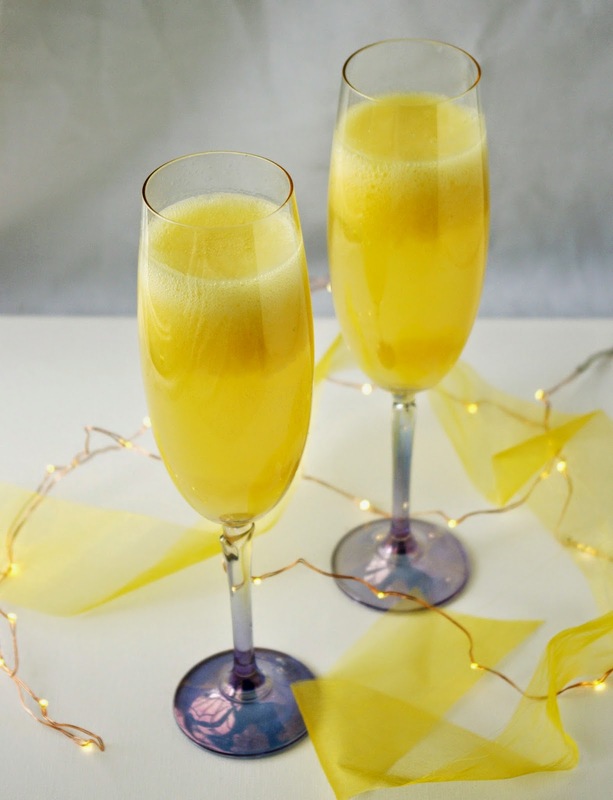 A bellini is traditionally made from peach puree, but I couldn't resist using fresh and fragrant mangoes that just scream summer and celebration to me. To make the peach version just substitute the mango for four fresh peaches or 410g of sliced peaches. You can also make a delicious version using 150g each of strawberries, blueberries and raspberries. Remove flesh of mango and process in a food processor until smooth. Divide mango puree between glasses and top with sparking wine. And while I'm saying "cheers" I would like to take the opportunity to thank everyone who has read, liked, commented on or shared in any part of the nOATbook this year. There is obviously no point in writing a blog if no one reads it and I am humbled every single time I publish a post and people other than my Mum and sister take the time to read it! Thank you, I sincerely appreciate every single visit. A huge thanks to Lauren @ Create Bake Make and Lucy @ Bake Play Smile for their very warm welcome to their Fabulous Foodie Friday link up. Your shout outs, regular visits and comments have been highly encouraging and supportive to a new blogger such as myself. I thoroughly recommend you check out their blogs for a range of great recipes. Thanks to Jess and the 'IBOT' team. Essentially Jess hosts an awesome link up on Tuesdays and by joining in this year I have discovered a fantastic new community of Australian bloggers. A special thanks to Emily @ Have a Laugh on Me for sharing one of my first posts '7 things I do as a parent because I am also a teacher' on her facebook page. I couldn't believe the number of people who read it as a result and so it was a great kick start for my blog. Thanks also to Emma @ Five Degrees of Chaos and Sarah @ Creating Contentment for being early commenters who also shared their support on their social media. Thanks to Celia at Fig Jam and Lime Cordial for hosting the fantastic monthly 'In My Kitchen' round up. It has sent me many visitors but more importantly it has introduced me to some very talented and knowledgeable foodies who help keep me motivated and keen to try new things in the kitchen. Celia even mailed me some of her sourdough starter, Priscilla, so I could make my own. How wonderful is that?! It is especially nice to have regular readers and so a huge thanks to those who let me know you are visiting or liking especially Yuliya @ Welcome to Mommyhood, Malinda @ My Brown Paper Packages, Hope @ Nanny Shecando, Sam G, Alisha N, Alicia F, Lori L, Penny G, Lisa G, Noelene M, Michelle H, Sascha O and Sarah C.